The forward section of space shuttle Atlantis, docked to the International Space Station, is featured in this image photographed by an STS-132 spacewalker during the mission's first spacewalk on May 16, 2010 during the shuttle's final planned mission. Thisstory was updated at 1:36 p.m. EDT. Twoastronauts put the finishing touches on a new six-pack of batteries for theInternational Space Station Friday during their mission's third and finalspacewalk ? one that also sent them to the cargo bay of shuttle Atlantis forthe last time. AstronautsMichael Good and Garrett Reisman spent almost seven hours working in space to finishinstalling the six new solar array batteries ? each worth $3.6 million ? on theleftmost edge of the space station. "Thestation has a new six-pack," NASA commentator Kyle Herring said fromMission Control. Goodand Reisman replaced two of six old solar array batteries during today'sspacewalk. Four others were swapped out during a Wednesday excursion. Thebattery upgrade was one of the major goals for the Atlantiscrew's mission as the shuttle flies what is expected to be its finalspaceflight before being retired. NASAwants to make sure the station is as up-to-date on equipment and spare partsbefore its space shuttlefleet retires. After this flight of Atlantis, which is due to land nextWednesday, May 26, only two more shuttle missions remain. Thenearly complete $100 billion space station, however, is expected to keep flyingthrough at least 2020. Reismanand Good also visited Atlantis' cargo bay for what is expected to be the finaltime during Friday's spacewalk to retrieve an attachment base for the station'srobotic arm that is destined to be installed on the outpost's Russian segment. Sincethis is Atlantis' last scheduled mission, today's spacewalk ? or extravehicularactivity (EVA) in NASA parlance ? is expected to the last time astronauts workoutside this particular shuttle. "Thanksfor being with us these last three EVAs. It was awesome," Reisman said ashe thanked Mission Control and his crew's instructor team. Atlantispilot Dominic "Tony" Antonelli, who choreographed the spacewalk frominside the shuttle, asked the spacewalkers to pose while he took photos throughan orbiter window. Thespacewalkers said they could easily spot their launch pad at NASA's Kennedy SpaceCenter in Florida from space while working in Atlantis' 60-foot (18-meter)payload bay. "Ohwow, that is cool," Good said. "I can see the [Shuttle LandingFacility]. I can see the two pads." Theastronauts said they could see the runway where plan to land next Wednesday. "Houstoncopies, but we'd rather you not land just yet," radioed Mission Controllightheartedly. Thenew batteries replaced a set of 10-year-old ones that had outlived theirdesigned lifetime on the station's oldest solar array. 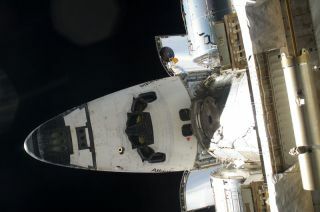 Another set of six otherbatteries was replaced last year on an earlier shuttle mission. Thestation's batteries store the electricity generated by its expansive solararray. They are big and square ? about 3 feet (almost 1 meter) per side ? andweigh about 375 pounds (170 kg) a piece. Theastronauts also installed a liquid ammonia jumper hose for the station'scooling system among other tasks. They made sure to take time to soak in theview of Earth from space. "Ithink I'm right about over the English Channel here," Reisman said as thestation sailed over Europe. "Somebody swam that? That seems like a longway." Friday'sspacewalk was the third and final spacewalk Atlantis' STS-132 mission to theInternational Space Station. In all, the shuttle's three-man spacewalking team,working in pairs, spent 21 hours and 20 minutes outside Atlantis and thestation during the three spacewalks this week. Theshuttlelaunched May 14 on a 12-day mission to deliver the station batteries, a newRussian research module and other spare parts. ForReisman, the excursion marked his third career, giving him a total of 21 hoursand 12 minutes of spacewalking time. It was the fourth overall spacewalk forGood, who ended with 29 hours and 53 minutes. Friday'sspacewalk was also the 146th spacewalk dedicated to space station assembly and maintenancesince construction began on the outpost in 1998. Atlantis'current mission is the 32nd spaceflight for the orbiter and the 132nd shuttleflight since the reusable space plane fleet began flying in 1981. Atlantis hasbeen launching into space since it entered service in 1985. NASAis retiring its three-orbiter fleet to make way for more ambitious technologyand exploration programs aimed at sending astronauts to visit an asteroid and,eventually, Mars. Atlantiswill be prepared to serve as a standby rescue ship in support of NASA's finalscheduled shuttle mission (Endeavour's STS-134 flight to launch no earlier thana Nov. 27). Somemembers of Congress are lobbying to give Atlantis one final mission as a sendoff,but no funding for extrashuttle flights beyond the two scheduled after this one has been approved,NASA officials have said. Thecrew of Atlantis will now prepare to leave the space station. On Saturday, theastronauts will pack a hefty cargo carrier back in the shuttle's cargo bayusing the station's robotic arm. The shuttle is due to undock Sunday and landin Florida on Wednesday morning. SPACE.comis providing complete coverage of Atlantis' STS-132 mission to theInternational Space Station with Senior Writer Clara Moskowitz and ManagingEditor Tariq Malik based in New York. Clickhere for shuttle mission updates and a link to NASA TV.